Founded in 2009, MetaRetail is a high-tech Internet retail company that focuses on custom built software technologies and processing efficiency to drive growth and bra﻿nd awareness. Our proprietary software system, continually developed and improved over the last 9 years, now encompasses over 190,000 lines of code! MetaRetail sells directly to consumers though our extensive online reach and brick and mortar presence. We work extensively with over 500 partners to build and protect their brand while generate sales. 2009 - MetaRetail was formed. Originally operating out of a 700 square foot office located on the second floor, with no elevator. March 2012 - Running out of space, we moved into 16,000 sq foot warehouse & office located in the old US Surgical complex. 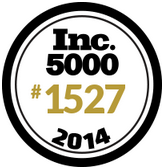 In August of 2014, MetaRetail joined the Inc 5000, being recognized as the #78 fastest growing retail company in the United States and the #12 fastest growing company in Connecticut! As of February 2018, MetaRetail was ranked the #48 largest Amazon.com retailer by MarketPlacePulse.com! MetaRetail headquarters in Norwalk, CT.
Our new warehouse in Stratford, CT.
Ice cream party, Fall 2014.